The Grail lit up again, and old Joseph was holding it in his hands. Dares glided forward, holding his iron lamp. "Yes," Balthazar said to himself, "it's them, the shadows of yore. I can't see Asverus, nor Samuel, nor Rizpah, those whose were true phantoms in life. Here are the characters of my soul coming to life again; we're going to live." Summoning them to follow him with a gesture, he went inside the Palace. Night extended over the world, and the pale disk of the Moon unswathed itself of its clouds. The Silence was eternal. Gustave Kahn, born in in 1859, was at the heart of the Symbolist Movement in the 1890s, a pioneer and champion of free verse and one of the editors of the prestigious Mercure de France. Much Symbolist prose -- The Tale of Gold and Silence (1898) is a cardinal example -- can be construed as an exercise in the further development of the archetypal images subsequently categorized and explored by Jung. 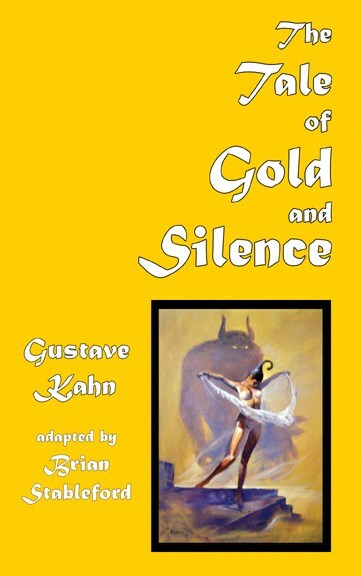 The Tale of Gold and Silence (1898) occupies a location that is virtually unique. It is not only Kahn's most overtly extravagant symbolist novel, but one of the most overtly extravagant symbolist novels ever attempted, mingling parables, Old Testament and visionary fantasies, throwing in a couple of mock-folktales and an adventure story for good measure. Kahn's knowledge of and attitude to symbolism was colored by his Jewish heritage, and it was natural for him to deploy symbolist methods in his reexamination of Old Testament mythology and the supposed modifications introduced by the subsequent reinterpretation of much of that mythology by the New Testament.